Whether you are new to this water activity or you are just looking for a casual way to spend a day at the beach, finding the best beginner surfboard is among your main priorities. Obviously, there are plenty of models out there and although they do share lots of similarities, small details often make the difference in the long run. Deciding on the right model is a matter of personal necessities – your skills, expectations, size and specific characteristics. But before diving in and deciding on a model, it's imperative to do your homework, figure what to look for in a surfboard and how this activity can help you out. 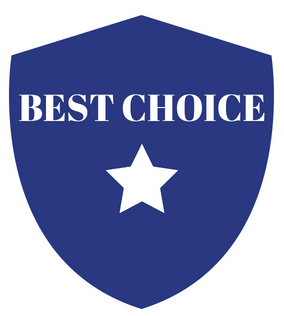 However, for those who wants to skip straight to our final verdict, here are our top picks. Available in a few different colors, this model from Gold Coast Surfboards is ideal for both beginners and more experienced users. It's designed to last, but also to adapt to your skills as you gain more balance and confidence. This surfboard measures 104 inches in length. It's in the middle range, so it's suitable to more uses. It maintains a decent balance and allows plenty of stability. It's custom molded with EPS foam. The closed cell foam is not just lightweight, but also durable. It offers an amazing density and flexibility. Just like the other models in this range, it comes with two wooden stringers, as well as a central fiberglass one. It's easy to control while you turn or track. The foam is covered in two layers of resin for more rigidity, but also to ensure a higher durability. The rails are tapered, while the nose and tail rockers are designed with beginners in mind. When getting a surfboard, the last thing you want is being unable to use it because you have to buy other accessories. 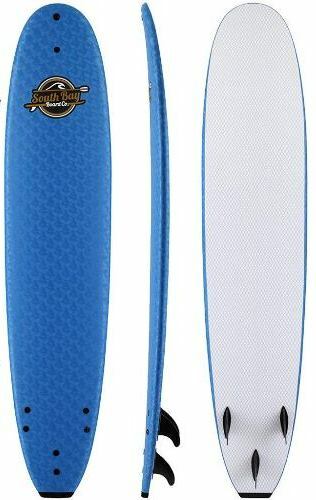 This surfboard can be used out of the box because the package has everything you might need for a good experience. 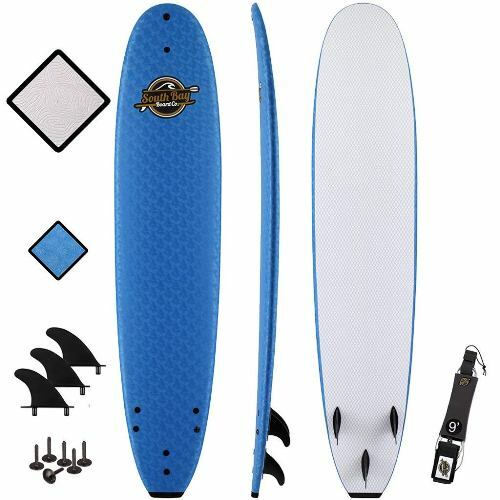 Simply put, the board comes with surfboard fins that can be attached wit screws, as well as a surfboard leash to avoid losing it. Other accessories include the traction pad and the paint pens. Looking for a way to transport and store the board without scratching it? Consider it done! There is a perfectly fitting surfboard bag included – specifically designed for this model. Simply put, just put all the parts together, head to the beach and start paddling. While some bells and whistles may actually do nothing for you, this surfboard has just the right features to make your experience smoother. The nose and tail are perfectly shaped for extra stability, as well as performance. It's great for newbies, as well as more experienced users. The double concave on the bottom boosts the fin performance. Interested in shooting your best surfing sessions? Consider it done – there are plugs on the nose to mount your camera. Just make sure it's a waterproof camera. Other than that, fin come with holes, but they also prevent water entry. Coming in three different colors and with just the basics, this is the kind of surfboard that won't exaggerate with the price for random bells and whistles that you'll never use. Instead, Liquid Shredder sticks to the basics only and can definitely exceed most expectations. Measuring 84 inches in length, this is one of the best surfboards for riders who plan to go farther. It's shorter than other similar boards, so it'll feel a bit difficult at first. But then, it will force you to push harder and gain experience faster. If you end up riding this board, you'll most likely be able to handle longer boards as well. The same rule applies to its width (20 inches) and thickness (2.75 inches). In terms of weight, it can take riders up to 140 pounds in weight. It's obviously recommended to beginners and small riders. However, more experienced riders can easily exceed the maximum weight, yet it requires more knowledge in controlling the board. Plus, you have to be fast when you stand up. Just like many other surfboards in this segment, this model has an EPS foam core. It's a soft core, but it's dense and lightweight. It ensures a durable construction as well. The bottom is harder and allows a proper gliding experience. As for stiffness, you can count on wooden stringers. The surfboard is heat laminated. What does that mean? It looks sleek and feels smooth. It literally cuts through water and it creates no resistance at all. Given its compact size, chances are you'll move faster than other riders, whether you paddle or ride a wave. The smooth surface allows gliding without too much effort, so riding it won't feel like a workout. This board has exactly what you need to start riding waves out of the box. Apart from the board, the package also includes fins. Put everything together and rush to the beach. Given the low price, you shouldn't expect any fancy features or random accessories. For example, you won't have a leash or a bag. But then, these are not some actual minuses. Instead, the manufacturer is based on providing basic features at an outstanding quality. You won't need a leash to surf, just like you won't necessarily need a bag to store the board. Suitable to beginners, good for experienced users and perfect for intermediate surfers, this model from WavestormTM might be one of the best foam surfboards on the market today. It's part of a more comprehensive collection and each model is recommended to a particular category of surfers – based on experience and expectations mostly. The design is one of the most attractive features regarding this surfboard. Not only it looks sleek and fancy, but it's also durable. Unlike other surfboards, it comes with the CFTTM technology – graphic film. In other words, you can leave it in direct sunlight for ages and colors will never fade. It will maintain the same brand new appearance for years, always looking good and drawing some attention. The board measures 96 inches in length. It's rated as a small board. If you're new, it will force you to improve. If you're experienced, you'll love it. It measures 22.5 inches in width and 3.25 inches in thickness. Its 86 liter volume makes a good ratio for size and volume. As for its weight, it only goes to 11.5 pounds. It's easy to carry, regardless of your fitness levels. The surfboard is made from durable materials that will never fail on you. The strong EPS core is made to last. Plus, you have three marine ply stringers to make handling a breeze. The high density HDPE used for the bottom ensures strength and rigidity. You can hit the waves without damaging the board or affecting your control. As for the top deck and rails, you can count on soft EBS. In other words, the board is stable, regardless of its small size. The actual assembly leaves no room for mistakes either. Practically, the board components are fitted together with strong bolts to ensure nothing breaks apart, regardless of how hard the water impact is. In terms of convenience, extra features often make the difference. This board comes with a leash plug, as well as a removable ankle leash to avoid losing it. The texture feels soft. It's anti-slippery, so you won't have to worry about your stability. It will feel comfortable as well. 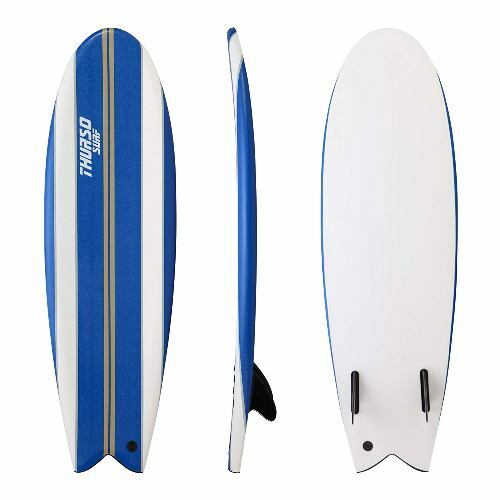 Designed to be small, speedy and extremely easy to maneuver, this unit from Thurso Surf can easily qualify as one of the best rated foam surfboards on the market. Given its small size, it's more suitable for experienced users, yet a newbie will also benefit from it, as it will inevitably push them to work harder. As for thickness, you have 2.76 inches. The board has 33.6 liters in volume. It only weighs 6 pounds. It's really light to move around. Just grab it under your armpit and head to the beach.The maximum rider weight is 200 pounds. More experienced riders can exceed that weight though. If you are looking for a bodyboard instead, click here. This surfboard is designed to be flexible, light and easy to maneuver. Despite its size, it's quite stable and allows focusing on stability. It's made from high density EPS foam, hence the lightweight profile. It's stiff and perfect for long hours of surfing. The bottom is made from HDPE. It's heat laminated and strong. It doesn't create any resistance, but glides through water with no issues at all. The deck is made from IXPE and also heat laminated. It perfectly seals the board to prevent delamination. The board features some small details that may look irrelevant at first, yet they're likely to ease your experience. You have two wood stringers for extra strength and rigidity. Stability is also improved by the two fins, while the fin box is adjustable. This way, the board is easier to move and allows a bit of customization. The fish tail adds to the traction and makes this board quite appealing to experienced riders. In fact, it's the primary choice for a few famous performance surfers. 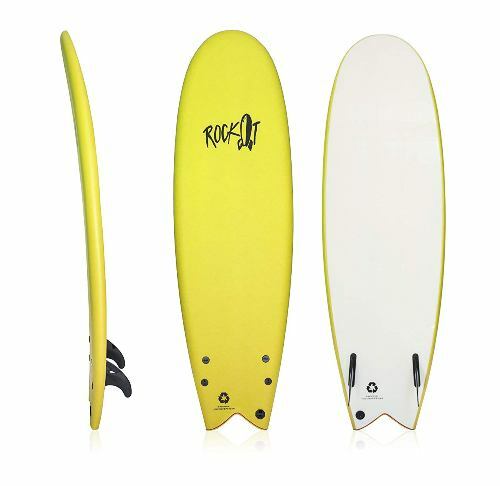 Coming in multiple colors and designed with simplicity in mind, this model from Rock-It can easily become one of the most reliable surfboard on the market. Rock-It is known for developing some of the most versatile models for beginners and this unit makes no exception. It's small, fast and provides plenty of stability. At a first glance, this surfboard is smaller than others in this segment. It only measures 68 inches in length. Given the size, it seems more suitable to experienced users – wrong! It's just as handy to newbies because it literally pushes them to work harder on maintaining balance and stability. Therefore, if you can ride this board, you can easily deal with larger models too. On the other hand, it's excellent for children as well. It measures 20.5 inches in width and just 2.5 inches in thickness. It glides and creates no resistance on water. In terms of weight, it can take people up to 175 pounds. Experienced riders weighing more can also try it out. The small size also underlines a lightweight profile. It's easy to transport and move around the beach, not to mention maneuvering it while on water. Rock-It is a primary choice for environmental advocates, mostly because it relies on recycled materials for its surfboards. This unit is also based on recycled EPS foam. The closed cell foam is high density, so it's rigid and stable. The rigid construction is enhanced with a bottom layer of fiberglass – right under the soft top. It weighs 6 ounces and covers the whole surface. Its smooth profile adds to the overall durability, as well as the rigidity. The top is a bit softer and features an anti-slippery surface. It doesn't look like it, but it's extremely efficient. Your stability will never be affected by water. 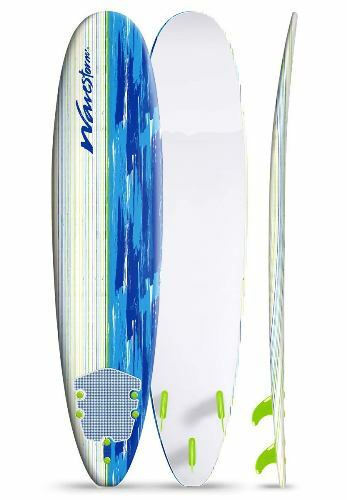 The twin fin design will draw plenty of attention, especially if you get this board for your children. Moreover, this style makes it extremely stable. No matter how low your experience level is, you'll still be able to maintain your balance without too much struggle. Other than that, you have two stringers as well. That's the main reason wherefore people go for surfboarding – having fun. If you love the water, riding on small waves or chilling while gliding away will make you the happiest person in the world. It's a fun sport to include in your water activities. You can share it with your friends or family – even your kids. It's fun to be in the sun and paddle away with your arms, but it's even more fun when you find a small wave and you ride it before splashing into the water. You may not necessarily pay attention to it, but surfboarding is an amazing cardiovascular exercise. It keeps your heart in a good condition and it also strengthens its muscles. This kind of activity targets the whole body, but mostly the upper core. You need those muscles for paddling, while leg work comes into play when you stand up and ride. You're more likely to spend more time paddling than riding though. The workout is low impact, so you won't feel soreness after – unless this is the first time you do it. Most people don't think about it, but paddling against waves actually requires some effort. Beginner surfboards for adults come with multiple benefits that might end up reflecting over your everyday life too. Learning to maintain your balance is one of them. You don't need balance when you sit on the surfboard, but everything changes once you stand up. Waves will move the surfboard left and right, so you'll naturally need to adapt and put your legs and core together. Sure, it takes some time. You'll fall a few times, but you'll learn to maintain your balance eventually. It's an improvement that will also help you out of the water. Forget about stress and go out on the water. Whether you had a stressful day at work or various problems in your everyday life, there are multiple options to relieve it. The sound of water while you glide on it is by far one of the most efficient solutions. A minimal surfboard is the way to forget about these issues. You have to focus on your balance and waves as you glide or surf. Plus, the low impact workout will relax you and remove tension off your muscles. What else can you ask for? Stress, problems and various conditions might seriously affect your sleep. Even if you do fall asleep, a restless sleep is just as harmful as no sleep at all. Surfboarding is one of the optimal ways to improve your sleep then. Surfing on a regular basis (as well as other types of exercise) will make you feel more tired and help you fall asleep faster and deeper. As a direct consequence, you'll enjoy more sleep and you'll wake up refreshed. It's a natural alternative to all kinds of harmful medications. 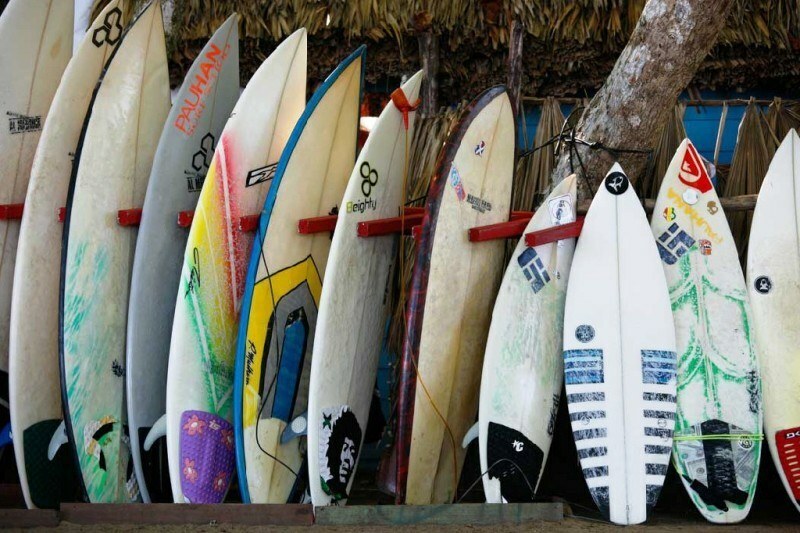 Your personal skills represent the main indicator in choosing a surfboard. Different models are appropriate for different skills. There are specific boards for beginners, as well as more sophisticated boards for experienced users. Of course, you can also find a middle solution that will suit multiple skills. Also, decide on what you want to do too. Do you like big waves? Do you enjoy paddling and rarely taking waves? All these things – as well as your expectations – should help you figure out what truly works for you. As for your personal progress, a good surfboard will inevitably adapt to your skills and needs. Size does matter when you look for the best intermediate surfboard. There are three factors you have to take in consideration – thickness, width and length. Each of them will affect the surfboard in a different way, hence the necessity to research your options. Your size is just as important in the process. If you have any friends who surfboard, you might want to borrow their boards and try out different styles. As if all these were not enough, the size of the waves is quite relevant too. Are you into small waves that barely go one foot in height? How about big waves of 5 feet? Lots of people would rather focus on length (which is important) than the actual volume. Well, the volume can seriously affect your surfboarding experience too. The volume should be chosen based on your body type. Fail to consider it and you might end up catching waves and trying to ride them when they're already gone. Choose the right volume and you'll be a machine. This consideration is more common as you gain experience though. 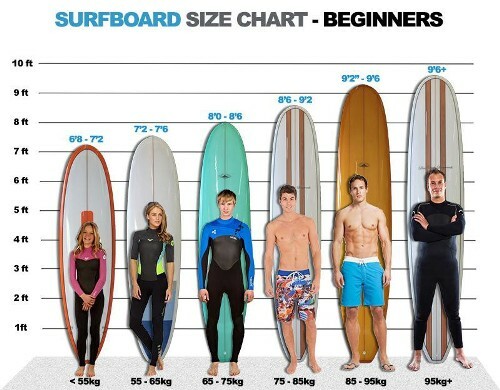 If you're a newbie, you should just check a beginner surfboard size chart. There are similar charts for volume as well. Becoming a surfboarding expert is a matter of commitment and hard work. Most people who start it don't expect to be experts, but they do it for fun. If you think surfboarding will make a great weekend activity or a relaxing solution after a long day at work, you might want to go for a longer board and more stability. On the other hand, if you want to become an expert, you might reduce the length for more control. Of course, it also implies more work, so this option is not so handy if you only want to relax. There are multiple materials to choose from. It depends on your preferences and skills. If you're new to this activity, epoxy and foam are ideal. You don't want a massive fiberglass board when you're just learning how to surf with it. You can also choose between molded and custom boards. Molded boards are factory made, which means they're general. The custom ones are self-explanatory. They don't make such good choices for beginners, as they have no idea what kind of custom features they need. Bottom line, finding the best beginner surfboard is usually a matter of preferences, expectations and experience level. Different models suit different people. Some of these boards are general though and may work for pretty much everyone. GC Heritage is one of these models. As one of the top rated surfboards on the market, it's helpful in literally in any situation. And it definitely worth a 5 stars rating.